In just a short span of time, Apple has released another iOS 10 Firmware update for iPhone, iPad and iPod touch devices i.e. iOS 10.0.2 (Build 14A456) Firmware version for upgradation and installation on iOS-powered smartphones and tablets. The official Direct Download Links of iOS 10.0.2 IPSW Files for iPhone 7 Plus, iPhone 7, iPhone 6S, iPhone 6S Plus, iPhone 6, iPhone 6 Plus, iPhone SE, iPhone 5S, iPhone 5C, iPhone 5, iPad Pro (12.9-inch / 9.7-inch), iPad Air 2, iPad Air, iPad 4th Gen, iPad Mini 4, iPad Mini 3, iPad Mini 2 and iPod Touch 6th Gen are also available below. Apple has includes several new fixes and improvements in iOS 10.0.2 Update with the addition of new features and functions as mentioned below. Untethered iOS 10.0.2 Jailbreak is still impossible. How to Install iOS 10.0.2 Update? 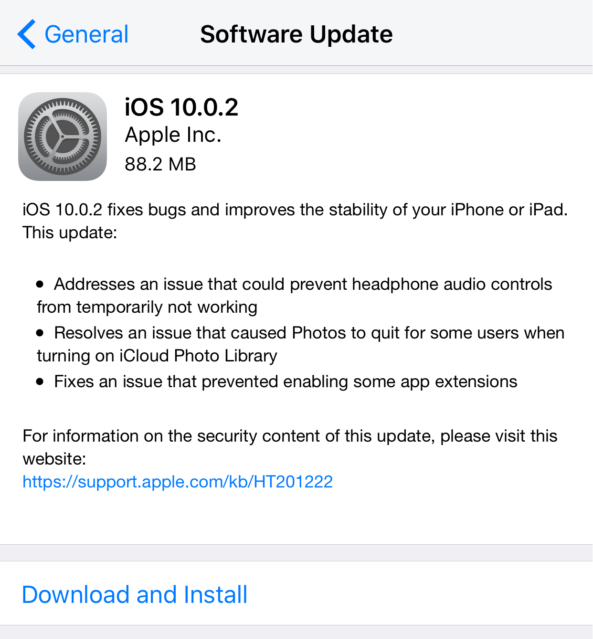 For iOS 10.0.2 OTA Update (over-the-air), navigate to Settings >> General >> Software Update option on your iPhone, iPad and iPod touch devices. For manual offline installation of iOS 10.0.2 via .IPSW Files using iTunes, you can free download iOS 10.0.2.ipsw files via direct official links below.